Posted in Miscellaneous	Tagged growing as a person, growing up, where's the food? So, i open up my Word Press account on Monday to a little orange trophy, which said “hip hip hooray congrats on your one year blogging queen status!” (something like that). I can’t believe that it’s been one year since I started posting all of my thoughts and feelings online for strangers and friends to read. I’m so happy that I decided to blog though, I think four gazillion people have run up to me saying “OMG I love your blog!” and half the time I’m like hey cool, who are you? but 100000% I smile, my heart’s warmed, and I feel happy and fluttery that someone likes what I have to say and cares enough to read it. I’ll let you in on something, I felt like a fish in high school, kinda swimming by, seen but not heard, and talked over a lot. I’ve always had a lot going on in my mind, but never really had it in me to ramble on like Led Zeppelin. There a few things I just wanted to say, didn’t know how to or who to tell, finally I ended up with a blog. Thank you to WordPress for being a functioning and free blog supporting website. Without you, I would probably be on BlogSpot. Thank you, Hannah, for being one of my biggest fans, reading and supporting me from the start. Thanks Cailyn, for being the blog’s number one fan. I don’t think anyone shares posts as much as you do. I’m so grateful that you like it so much! Thank you to Alison, Brad, Jasmine, Luke, Janey, Phoebe, Jenna, and Elizabeth for being such loyal and awesome readers! Thank you Sean….even though you didn’t read my blog for months, you eventually started and and encouraged me once to switch to YouTube vlogging so I could get paid. Thanks to the random guy who Facebooked me once telling me how much he liked my blog. You have no idea how much that means to me, Because people like you are exactly what keep me going. And just an overall thank you to everyone who has ever read any of my posts, smiled, laughed, shared, and simply enjoyed it. It’s you guys that keep me going. Thanks to anyone and everyone who shared my “You’ve Experienced Richmond If..” post 30+ times, I’m still in shock over how much people enjoyed and connected to it. Thanks to VCU, for having such weird but extremely awesome people, places and situations to write about as well as pool of hot guys to fantasize about. Thanks to my brother, whose way of showing support is saying “Your blog is awful. No one reads it and you should stop”. Thank you Daddy, Uncle Peter, Grandpa and Grandaddy for watching over me and being my guardian angels through this little journey. And a special thank you to Momma G, who has been behind this blog 100% since I first told her the big idea. Thank you for always reading, encouraging people to read, sending my posts to your friends, talking it up, pretty much being the blog’s PR. If I was getting paid for this, I would give you a portion, but since this is free, why I don’t I cook dinner? There’s only one other thing that could quite possibly top last week’s summer blogger challenge prompt. Well, two, if you count my dream husband, who arrives majestically on his surfboard, long blonde hair flowing in wind, a cup of coffee in one hand and chocolate cake in the other, with a PharmD degree to his name (I’m sorry I’ve seen a lot of cute guys in the past couple of days). So, what could this prompt really be? *Insert witty intro about how I’m reading ingredients on the back of Oreo boxes, the prescriptions you hand me, and those pointless emails VCU sends every day* Here’s what I’ve sincerely been reading this summer! Do you like short stories? Check. Do you like magical realism? Check. Do you like women? Check. 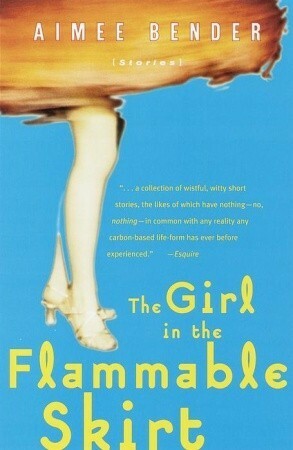 Aimee Bender’s Girl with the Flammable Skirt has all of the above! I first saw this book on a Buzzfeed article earlier this summer, and being a lover of short stories, I grabbed the book from the library and finished it in two days. The unexpectedness of the magical realism kept my interest the whole time, and all the stories connect with an overarching theme of women (one of my favorites is about a woman whose husband is the Benjamin Button of evolution). I wake up every Thursday-Sunday morning, ecstatic. Why is a college student happy to wake up in the morning, and only on those days? One Thurs-Sunday, we have the Richmond Times-Dispatch to go with coffee! The newspaper, a physical newspaper, is just one of those true and good things about life that I don’t think I can ever let go of. Even when I was young, I would read the comics as my parents read the “boring” parts over our breakfasts together. A couple years back I told my mom that I would exercise my right to be an informed citizen and start reading the paper again, and she reminded me that that wasn’t a part of the Bill of Rights. I just said “whatever” and grabbed the Metro section. Moral of my story? Read the paper. Smell the ink print. Get the Sunday issues, they’re the best. Buy the Washington Post if you’re fancy (which you so are). I will just come out and say it: STYLE WEEKLY IS PERFECT. Did you see last week’s issue about the Bob McDonnell trial, told as an activity book, including a maze to get Johnnie Williams to the Governor’s Mansion, Bob and Maureen McDonnell paper dolls, and a search to find the Antabloc? Maybe you checked them out in May when they released the “Best of Richmond”, my dear favorite printed issue of the year? And you’re checking them out for the “40 Under 40” later this month? Don’t even think about answering “no” to any of those questions, Style Weekly is 100% free and found in those little red huts on street corners, at coffeeshops, grocery stores, any where that good vibes can be found. I’ve read a few other books, magazines, and whatnot, but these have been my favorites for this summer. Man, as much as I want school to start back to see everyone/thing/History Now!/hot boys/etc, I’m not looking forward to being so busy that I won’t have time to read anymore. Well maybe with the new Urban Farmhouse opening in the spring, I can grab a cup of their coffee and a Style Weekly for some morning downtime before classes. Posted in Blogging World	Tagged aimee bender, books. style weekly. richmond times-dispatch, girl with the flammable skirt, jack kerouac, newspaper, on the road, where's the food?